This fortune cookie (the one to the left) really existed, and I never saw the like. I am used to fortune cookies containing old sayings, universal aphorisms, little smippets of wisdom, and sometimes a blandly optimistic prognostication of what the future holds. 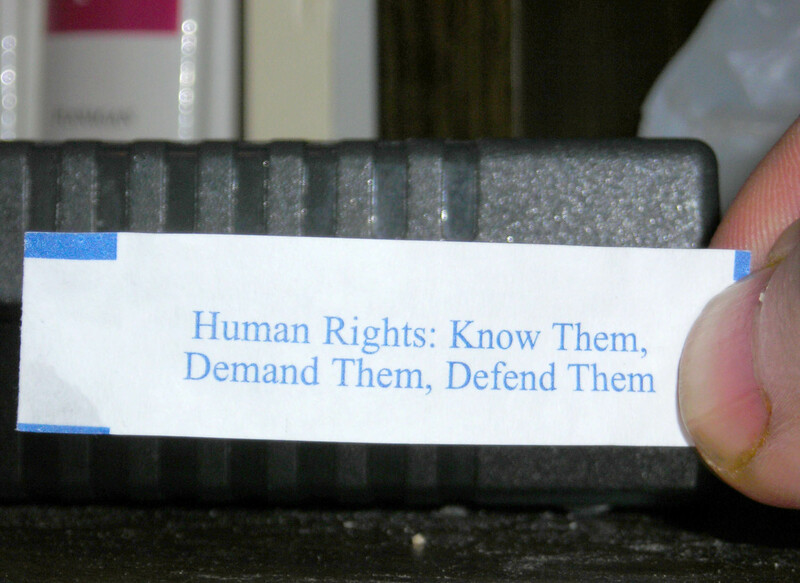 I would never have expected one to wield a statement on human rights. But there it was, printed in blue and white, plain as day. The other side of the fortune cookie says “Learn Chinese”, and teaches the phrase “Excuse me”, followed by a list of six lucky numbers. Four of those numbers are too big to use in Lotto 6-49. Here in the United States and Canada, our culture seems to take human rights for granted. The rights of stray dogs seem to get more attention than the free speech rights of protestors, worker’s rights and so on. We seem to feel more for an abandoned puppy than for an abandoned child these days. I am not sure how animal rights seem to have more cachet in a culture where I have heard about human rights offices and Public Interest Research Groups around North America being defunded or closing altogether, while animal shelters appear to have the status of five-star hotels. How do we get to a point where we have seemed to forgotten about all the struggles that gave rights to minorities, women, and aboriginals, just treating them as though they have always magically existed? No-one in this world has rights without a struggle, nor lost them without taking their short-lived nature and fragility for granted. The fact that we now have to look outside of our culture to places like the Middle East for examples of human rights advocacy tells us of how far we’ve fallen, and of how dysfunctional our own culture has become. A much more human-rights-friendly coverage of the Middle East protests appeared, ironically, in Pravda. They seem to quote Al Jazeera more openly, and more often. I know this is far from a human rights advocacy newspaper, and they have their own line of propaganda, but you have to look elsewhere in Pravda for more obvious examples.